The Battle of the Thames took place on October 5th, 1813 as part of the conflict of the war of 1812. The war of 1812 began for various reasons including numerous attempted invasions from Americans into Canada. The efforts from this war helped shape Canadian independence from the United States. 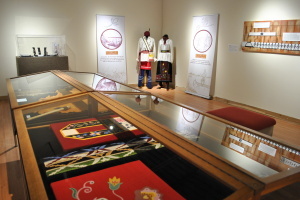 First Nation participants and our founding fathers were able to fight off invading American troops and establish a sense of Canadian nationalism. Between 1812 and 1813, Chief Tecumseh brought together First Nation tribes from across both sides of the border to defend native lands. I was inspired by MOA’s new exhibit on the Chippewa’s involvement in the war of 1812 so I traveled westward to the location of the Battle of the Thames just outside of Chatham Ontario. At the site, there is a plaque citing both the battle significance and the accomplishments of Chief Tecumseh. I was inspired to learn more about the Battle of the Thames and the circumstances leading up to it in the war. Before the Battle of the Thames, the British and First Nations proved victorious under the collaborative leadership of Sir Isaac Brock and Shawnee Chief Tecumseh which lead to a defining victory in the Battle of Detroit (August 16, 1812), allying the First Nations with the British. 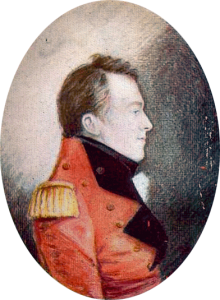 However General Brock died months later in the Battle of Queenstown Heights on October 13th, 1812. A new British General, Sir Henry Proctor was soon instated. He did not treat Tecumseh with the same respect as Gen. Brock nor did he face Battles with the same charisma and power, causing tension between the two leaders. The height of their tension came in May of 1813 when Americans tried to rush Fort Meigs, taken by Proctor and Tecumseh only four days earlier. Six hundred Americans were killed or captured, at which point First Nations attacked the captured Americans, killing twenty of them by the time Tecumseh arrived and stopped the slaughter. (This battle was similar to the River Raisin massacre fought by Gen. Proctor in January 1813. Proctor had promised safety to the Americans but then commanded the British and First Nation soldiers to slaughter them.) At the end of the Fort Meigs battle, Proctor told Tecumseh that his people can’t be controlled. Tecumseh, knowing his people were acting under command of Proctor responded by telling the General that he was not fit for command. Proctor proved Tecumseh’s point again five days later by abandoning siege. 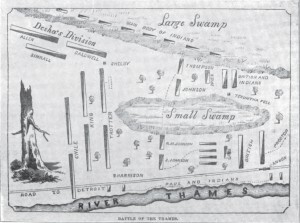 The Battle of the Thames held only 950-1000 British and First Nations against 3500 Americans. Tecumseh at this point did not trust Proctor, which was later justified after Proctor only sent one British Battalion with only one single six pound cannon to battle. Regardless, that afternoon Tecumseh held strong and rode into battle with his Deputy Oshawahnah the Chief of the Chippewa leading forces from the Shawnee, Ottawa, Delaware, Wyandot and the Sac, Fox, Kickapoo, Winnebag, Potwatomi, and Creek Tribes, about 500 in all. 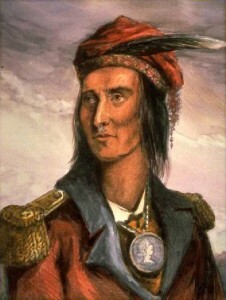 Tecumseh died in battle with circumstances surrounding his death remaining a mystery. Proctor later fled battle to rejoin his family in nearby Moraviantown. He tried to blame his men for the loss of the Battle of the Thames, but that did not save him from disgrace, being suspended from rank and pay for six months. To the Americans, the Battle of the Thames avenged the atrocities General Proctor lead on the American Captives during the River Raisin Massacre. The battle neutralized Anglo-First Nation threat and proved Tecumseh to be an irreplaceable loss to the war. As I walked through the forest and along the river bank, I found it hard to visualize the former battlefield. The entire place was eerily peaceful, and it was hard to believe that the same spot I was walking was once a firing ground. The stop along the highway is simple at best, nothing remains of its bloody past, but the feeling you get when you are in the same spot the Tecumseh took his last stand, completely surrounded by history, is simply amazing. From the east – from Highway 401 heading west, merge onto Highway 402 West towards Sarnia. Take Exit 86, and turn right onto County Road 2/Longwoods Road towards Melbourne/Delaware. Continue on County Road 2/Longwoods Road until you arrive at the road closure. From the south/west – from Highway 401 heading east, take Exit 109 and turn left onto Victoria Road/County Road 17/County Road 21 (signs for County Road 21 North/Victoria Road). Turn right onto London Road/Longwoods Road (signs for County Road 2 East), and continue on Longwoods Road until you arrive at the road closure. I enjoy frontier history, and the writings of Allan Eckert present an accurate account of it. Tecumseh was a prominent figure of the period, and I have been to his birthplace, and some other battle sites. I am planning on a visit to place of his death, and such a decisive event ot that war.